This step by step guide explains how you can use the External database integration tool to store the WordPress activity log (audit trail) of multiple WordPress websites on a single MySQL database. Note: the wp_ in the table name is a prefix. Every table in your WordPress database has the same prefix. 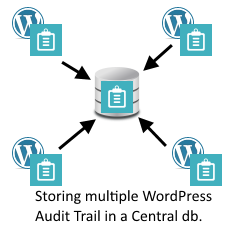 Refer to the WP Security Audit Log database documentation for more details on how the WordPress audit trail is stored. The concept for this is very simple – when configuring the plugin to store the activity log in the same external database where the activity logs of other sites are stored, specify a different tables prefix for each website. The other option would be to enable the setting Use the website URL as table prefix when configuring an external database connection so the unique URL of a website is used as a prefix, thus ensuring there are no conflicting table names. Following is an example of how to store the WordPress audit trial of both the websites wpwhitesecurity.com and wpsecuritybloggers.com on the same MySQL database. When configuring the External Database on the website wpwhitesecurity.com we specified wpw as prefix. When configuring the External DB add-on on wpsecuritybloggers.com we specified wpsb as prefix. wpw_wsal_metadata and wpw_wsal_occurrences in which the WordPress audit trail of wpwhitesecurity.com is stored. wpsb_wsal_metadata and wpsb_wsal_metadata wn which the WordPress audit trail of wpsecuritybloggers.com is stored.